1. Turkeys are no "bird brains." 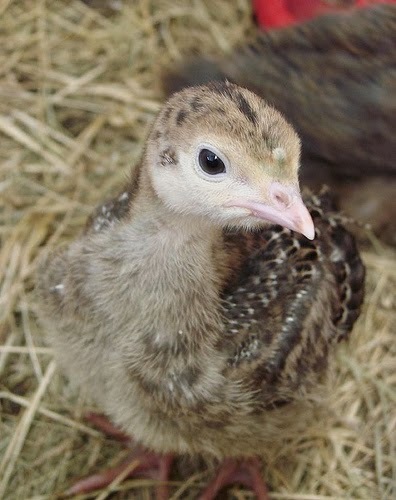 Turkeys are smart, social birds who like having their feathers stroked and gobbling along to music. Benjamin Franklin called turkeys "true American originals." He had tremendous respect for their resourcefulness, agility, and beauty. These inquisitive birds can learn the precise details of an area of more than 1,000 acres. As poultry scientist Tom Savage says, "I've always viewed turkeys as smart animals with personality and character, and keen awareness of their surroundings." 2. Factory-farmed turkeys have nothing to be thankful for. On factory farms, turkeys are packed so tightly together in filthy sheds that flapping a wing is nearly impossible. To keep the birds from pecking one another in frustration, farmers cut off part of their sensitive upper beaks with a hot blade—using no pain relievers whatsoever. 3. "Humane meat" is a myth. PETA has yet to find a "humane" farm where animals aren't kept in deplorable conditions. Turkeys on so-called "free range" farms still have their beloved babies taken away from them, just as animals on conventional factory farms do, and they're all sent to the same terrifying slaughterhouses. 4. Turkeys suffer in slaughterhouses. When turkeys are just 5 or 6 months old, they're crammed into transport trucks and taken to the slaughterhouse, where they're hung upside down and their throats are cut while they're still conscious. Many are scalded alive in the tanks of water used for feather removal. Watch PETA's "Glass Walls" to see footage from factory farms and slaughterhouses. 5. Turkey is no health food. Turkey flesh is high in fat and cholesterol, and it's frequently contaminated with salmonella bacteria. Farmers give turkeys antibiotics to stimulate their growth and keep them alive in the filthy, disease-ridden conditions that would otherwise kill them. Leading health experts believe that this overuse of antibiotics is largely responsible for the spread of antibiotic-resistant superbugs. Fortunately, faux turkey is tasty and cholesterol- and cruelty-free. We can all give thanks for Tofurky, Celebration Roast, Gardein’s Savory Stuffed Turk’y, and other animal-friendly holiday foods. PETA offers a variety of vegan recipes and product suggestions to help you and your loved ones prepare a humane holiday feast. Happy Thanksgiving! People for the Ethical Treatment of Animals (PETA) is the largest animal rights organization in the world, with more than 3 million members and supporters. PETA focuses its attention on the four areas in which the largest numbers of animals suffer the most intensely for the longest periods of time: on factory farms, in the clothing trade, in laboratories, and in the entertainment industry.